The first warm spring day found us attracted to the park like bees to flowers. The warm air, fresh green grass and setting sun made the park too irresistible. As a family, we ran through the park, tossing a football around. “Catch it, catch it, Elijah,” I hollered as the football zoomed through the air from his Daddy’s hands. He caught the ball and hugged it his body, no sooner than he could say touch down, his big sis tackled him. This erupted into howls as Elijah kicked his sister. SIGH… In goes mom (me) trying to find something wise and Biblical to say. “When we get home, we’re going to see what the Bible says about self-control, Buddy,” I replied trying to be the wise-but-cool mom. 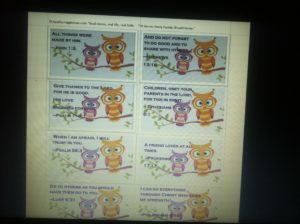 Later that evening I found dozens of Scriptures about self control. And the thought hit me, why can’t we memorize scriptures as a family on areas we all need help like self control and compassion? Why can’t I take everyday moments and make the Bible come to life for my kids? As a light went off in my mind, more thoughts flooded my heart. Is it just me or have we has moms become a little too complacent in taking Biblical leadership at home? The thought hit me that I had relied too much on Sunday School and my son’s Christian school to teach Godly principals. With a marker and post it notes, I copied out key verses and posted them all over the house, including one in the kids’ bedrooms, the bathroom mirror, by the dinning room table, in the cars, and on the fridge–I even posted them onto the front of our TV. 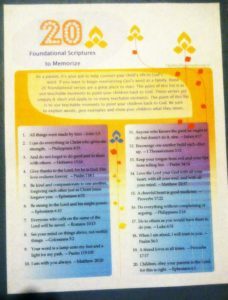 What I found over time are Scriptures that are so foundational, they applied to several areas, I also noted certain issues were becoming less and my kids began quoting Scripture to each other. The foundational truths were being laid in their hearts! If you’re looking for a good place to start with your kids, these 20 Verses are the perfect place to start. And even better, I made a printable version below, so you can print them out and post them all over your house. 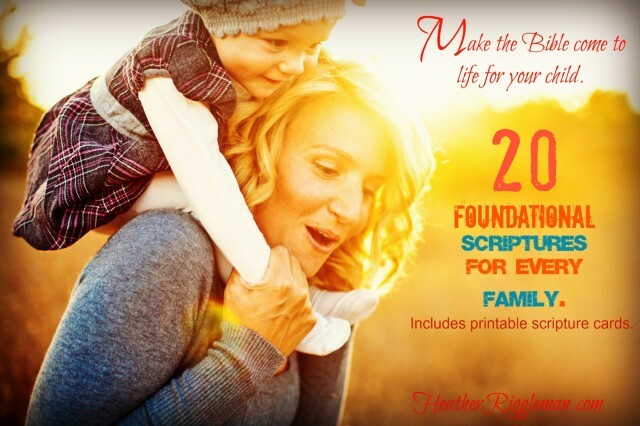 20 Scripture Foundational Verses for every Family. 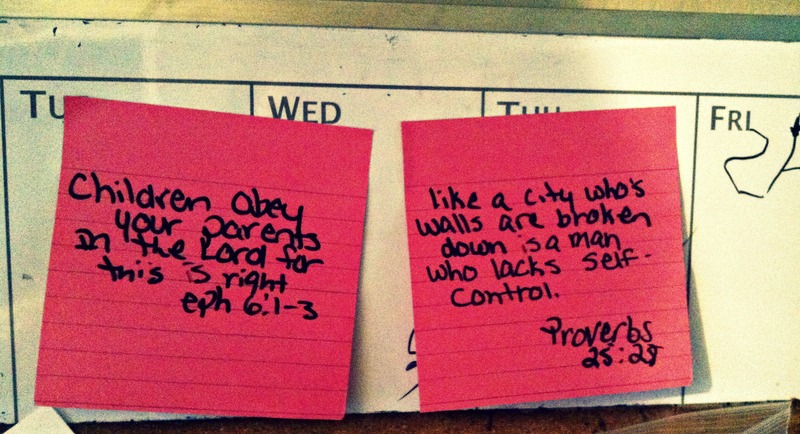 Prayer Journal Verses for Mother’s Day! Heather this is great stuff for parents! I’m sharing this over at http://www.facebook.com/1Corinthians13Parenting today! Thanks!